I recently contacted the exceedingly talented LuckyNo.5 from the Eye of Error blog about commissioning a big ol' banner for the Leviathan. After all, the regimental command vehicle ought to have a suitably impressive banner! LuckyNo.5 is responsible for the blog banner proudly splashed across the top of this page, and also made the spectacular banners for my Heresy-era Thousand Sons that can be seen scattered throughout the force. He's also made numerous blog banners for other folks, and is currently involved with the rather excellent Dark Eldar forum The Dark City as well as the Standard Template Construct blog. We discussed some ideas about what the banner should look like, and he sent me a couple examples he worked up. I have to say, he knocked it out of the park on the first try! 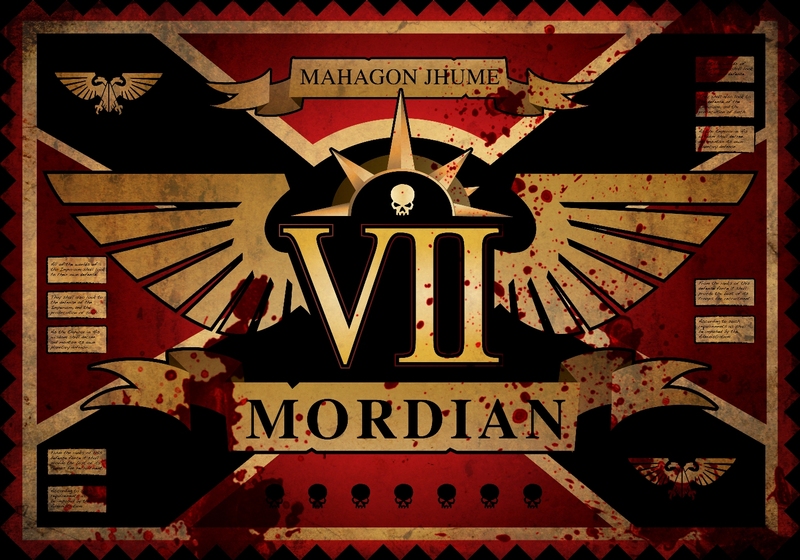 The 'patron saint' of the Mordian 7th Regiment is Mahagon Jhume, the martyred leader of the Night Rippers hive gang from which the vast majority of the regiment was drawn, and his name has pride of place across the top scroll. The various little text boxes include the declaration raising the regiment, which is a great touch - Unfortunately they're going to be too small to read when shrunk down to the final banner size, but will look great nonetheless. The red and black dags around the perimeter hearkens back to the serrated knife blade that is the unofficial emblem of the regiment. All around, I couldn't be happier! He also went one step further and worked up a battle damaged/bloodied version of the banner that I will be using for the glorious 7th's Regimental Command Squad. Absolutely brilliant stuff! In fact the super high res version of the above banner is now my desktop background (at 3000x2100 pixels, it's huge)! 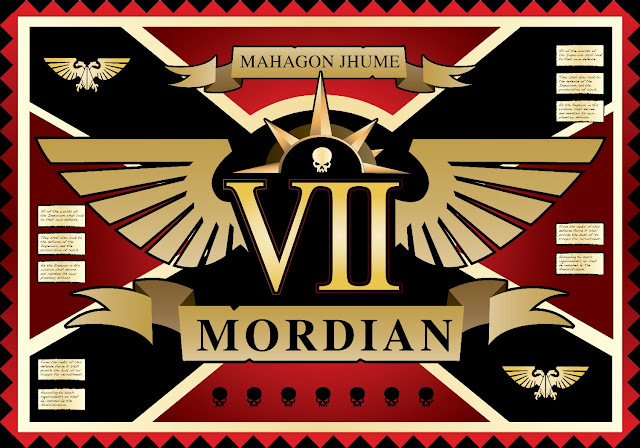 If you're looking for a new blog banner, or some frankly awesome banners for your army, LuckyNo.5 is your man. I heartily recommend his work, and I am constantly amazed at his amazing talents at converting, painting and being an all-around great guy! Ic an't wait to see the banner in action! That will look AMAZING on the model. They look great - LuckyBo.5 you did a great job. I'm interested what you print them too - is it just paper or some special material? @LuckyNo.5 - Thank you for making it, it is going to be perfect! @Damn The Valley - Indeed, it's definitely got me excited to finish up the build, just to see how it will look on the painted machine! LuckyNo.5 certainly has some great desigin skills. This banner will look splendid in action. Awesome! That is really going to give the Leviathan what it needs. Every time I stop in to see how the project is progressing I say 'wow'.